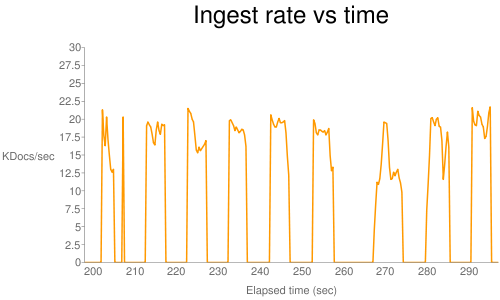 Changing Bits: Lucene's indexing is fast! 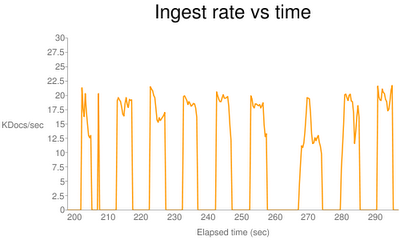 Wikipedia periodically exports all of the content on their site, providing a nice corpus for performance testing. I downloaded their most recent English XML export: it uncompresses to a healthy 21 GB of plain text! Then I fully indexed this with Lucene's current trunk (to be 4.0): it took 13 minutes and 9 seconds, or 95.8 GB/hour -- not bad! There is no field truncation taking place, since this is now disabled by default -- every token in every Wikipedia article is being indexed. I tokenize the body field, and don't store it, and don't tokenize the title and date fields, but do store them. I use StandardAnalyzer, and I include the time to close the index, which means IndexWriter waits for any running background merges to complete. The index only has 4 fields -- title, date, body, and docid. Lucene's wiki describes additional steps you can take to speed up indexing. Both the source lines file and index are on an Intel X25-M SSD, and I'm running it on a modern machine, with dual Xeon X5680s, overclocked to 4.0 Ghz, with 12 GB RAM, running Fedora Linux. Java is 64bit 1.6.0_21-b06, and I run as java -server -Xmx2g -Xms2g. I could certainly give it more RAM, but it's not really needed. The resulting index is 6.9 GB. Note that a large part (slightly over half!) of the time, the ingest rate is 0; this is not good! This happens because the flushing process, which writes a new segment when the RAM buffer is full, is single-threaded, and, blocks all indexing while it's running. This is a known issue, and is actively being addressed under LUCENE-2324. Flushing is CPU intensive -- the decode and reencode of the great many vInts is costly. Computers usually have big write caches these days, so the IO shouldn't be a bottleneck. With LUCENE-2324, each indexing thread state will flush its own segment, privately, which will allow us to make full use of CPU concurrency, IO concurrency as well as concurrency across CPUs and the IO system. Once this is fixed, Lucene should be able to make full use of the hardware, ie fully saturate either concurrent CPU or concurrent IO such that whichever is the bottleneck in your context gates your ingest rate. Then maybe we can double this already fast ingest rate! In addition to the flush issue, I wonder if we shouldn't use a less expensive encoding for segments smaller than X docs (or N bytes), maybe even write much of the data uncompressed? With flexible indexing it should be simple to make a codec that switches the underlying encoding (similar to how Pulsing codec works), eg based on doc count in the segment. I also want to make codec that decides term by term which encoding to use -- pulsing for very low freq terms, maybe standard for medium freq, and FOR/PFOR for high freq. If you are looking for a good academic writing service, this is the best place to order your paper.